Dun Laoghaire Regatta 2015: 400 Boats & 3,000 Sailors, It's Dublin Bay Sailfest! #dlregatta – With the Kinsale ICRA Nats/Sovereigns Trophy 2015 very successfully concluded last weekend, and a classic Dun Laoghaire to Dingle Race put stylishly in place before that, the feeling of another sailing summer busily in progress is all-pervasive. But while the image projected may well be one of stately progress by the cruiser-racer fleets along the Irish coast, taking in an offshore race here and a regatta there with much leisurely cruising in between, the reality is usually otherwise. For those boats doing significant segments of the programme, it's a case of fitting chosen events into the usual hectic early summer life of work and family commitments and exams and everything else, with the re-location of boats to the next venue being a hurried task undertaken by delivery crews. In the dozen or so years since its inception, the biennial Volvo Dun Laoghaire Regatta has settled itself firmly into the sailing scene as an exceptionally varied event in terms of the boats and classes taking part. 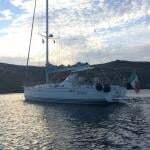 There are five regular cruiser-racer classes, plus an offshore division, fourteen one design keelboat classes, and nine dinghy classes. And although there are contenders from Ireland's north coast and from the Cork area and south coast too, together with one gallant entry from Galway, it is essentially an Irish Sea Sailfest, though with a remarkably strong Scottish presence. However, it was on the coast of Wales at 8.0pm last night that this sailing celebration began, with an ISORA Race starting in Holyhead and heading for Dun Laoghaire to set this large and complex programme into action towards a culmination on Dublin Bay in eight days time with the conclusion of VDLR2015. 2015 marks the Bicentennial of the Royal Dee YC, which was founded in 1815 on the Cheshire shores of the River Dee estuary where northwest England marches with northeast Wales. Originally the Dee Yacht Club (and founded, it's said, a month or two before the Royal Yacht Squadron came into being in the south of England, making the RDYC the second-oldest Royal yacht club in England after the Royal Thames), the Cheshire club became the Royal Dee YC in 1847. Although the great prosperity of Liverpool in the 19th century saw the club's fleet of substantial yachts gathered in the Dee and then increasingly in the Mersey, by the late 1900s it was looking to the Menai Straits area as the focus of its keelboat events. As well, the completion of Holyhead breakwater in 1873 added a new and important harbour to its list of possible big boat sailing locations, and there was an increase in the number of cross-channel "matches" which the Royal Dee and the Royal Mersey, in conjunction with the Dublin Bay clubs, had already been running for some years. The bicentenary logo of the Royal Dee YC. In 1815, this club on the Cheshire coast was founded shortly before the Royal Yacht Squadron in the souh of England, whose Bicentennial is being celebrated at the end of July. Dun Laoghaire saw its first regatta staged in 1828, and participation by yachts from the northwest of England and North Wales was regularly recorded. This is the Royal St George YC regatta of 1871. The Lyver Trophy is the Royal Dee's premier offshore challenge, and this year it is special, as it's a fully-accredited RORC event counting for points in the annual championship, and a highlight of the ISORA Programme 2015. It's start scheduled for yesterday evening in Holyhead will see the fleet – mostly regular ISORA contenders – sail a course of at least a hundred miles before finishing in Dun Laoghaire. Then as VDLR 2015 gets under way, races in it, combined with the Lyver Trophy results, will count as part of a series towards finding an overall winner of the RDYC Bicentennial Trophy. Only entrants in the Lyver Trophy race are eligible, and for that race itself – which can be followed on the Averycrest Yellowbrick Tracker - the favourite has to be the Shanahan family's J/109 Ruth, still buoyed up by her great victory in the Dun Laoghaire to Dingle Race three weeks ago. At the other end of the size scale, the VDLR2015 Dublin Bay programme includes several dinghy classes, and the biggest fleet will be mustered by the International GP 14s, who have designated the racing in Dublin Bay as their Leinster Championship. In an interview with Sailing on Saturday in March, VDLR Chairman Tim Goodbody emphasised that, overall, the event should be seen as a regatta rather than a championship, and for most boats that's just what it will be. But the GP 14s with their great esprit de corps have always done things their own way, and with their compact boat size – albeit comprising a large fleet of dinghies – they reckon they can get in a proper championship while sharing in the fun of the event. As to who is favourite, the McGuinness brothers – Donal and John - from Moville in Donegal, with their top-of-the-line Duffin boat built in Northern Ireland, have to be in the reckoning after being top Irish at last year's Worlds on Strangford Lough, but there's fresh blood in the fleet with the newest class developing at Youghal, while this year's recent Ulster Championship on Lough Erne was won by the Greystones duo of Shane MacCarthy and Damian Bracken. The dozen and more boats coming south from Scotland, most of them substantial cruiser-racers, are testimony to a growing trend in sailing on Europe's Atlantic seaboard. Given a choice of venues, your average yachtie on this long coastline will incline to head south if at all possible. Other things being equal, it's reckoned the further south you go the warmer it is likely to be. And from the upper reaches of the Firth of Clyde, there are times when Dublin Bay might seem like the distant and sunny Mediterranean. Maybe so, but we'd caution that much depends on the moods and location of that all-powerful weather determinant, the northern Polar Jetstream. In July, so long as it's well clear of Ireland -whether to the north or the south - we will have glorious high summer, and that occurred for the previous VDLR back in 2013, where the photos speak for themselves. So we hope for the best in looking forward to welcoming a fleet of around 415 boats to Dun Laoghaire between July 9th and 12th, with all four of our in-harbour yacht clubs extending the hand of hospitality in a regatta tradition that goes right back to 1828. But while heritage and ceremonial are all very well in their place, it's the prospect of good sport which energises the participants and their sailing, and with several major contests already logged in 2015, what can we expect on the leaderboards next week? At the top of the tree, Class 0 has formidable competition, including former Scottish champion Jonathan Anderson racing his XP38i Roxstar against the Royal Cork's Conor Phelan with the Ker 37 Jump Juice, which was one of the best performers in last year's ICRA Nationals at the same venue, and this year again became a force to be reckoned with as the breeze sharpened in the four day Kinsale ICRA Nats 2015/Sovereigns Cup a week ago. With a win in the final race, Jump Juice came in second to seasoned campaigner George Sisk's class overall winning Farr 42 WOW (RIYC), the pair of them in turn displacing the early leader, lightweight flyer Mills 36 Crazy Horse (ICRA Commodore Nobby Reilly & Alan Chambers, HYC) down to third in the final day's racing, so Crazy Horse will be hoping for a return of lighter breezes when racing starts next Thursday on Dublin Bay. 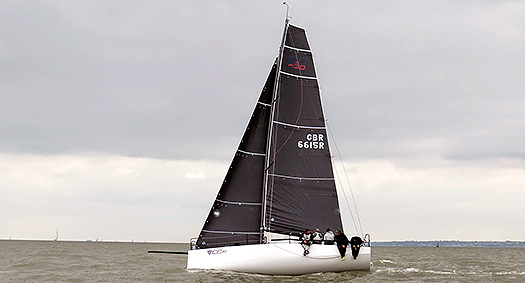 In the previous Volvo Dun Laoghaire Regatta in 2013, the most successful boat in was Nigel Biggs' much-modified Humphreys Half Tonner Checkmate XV, but this year the Biggs team is racing as Checkmate Sailing with the newest boat in the fleet, the Mark Mills-designed American-built C & C 30 OD Checkmate XVI. She may be only 30ft LOA, but she's such a hot piece of work with so many go-fast bells and whistles that she has a rating of 1.140 to put her in Class 0. The oldest boat in the cruiser-racer fleets will be found in Class 3, where the 44ft Huff of Arklow is making an historic return to Dublin Bay racing. Originally built in 1951 by Jack Tyrrell of Arklow to a design by dinghy genius Uffa Fox, Huff is so-called because her concept is reckoned three-quarters Uffa Fox and one quarter Douglas Heard. The latter was the founding President of the Irish Dinghy Racing Association in 1946, and he later went onto to become Commodore of the Royal St George YC and a noted cruising and offshore racing enthusiast with this unusual boat, which is like a very enlarged Fying Fifteen with a lid – in fact, with her 30ft-plus waterline, she was described as a Flying Thirty. 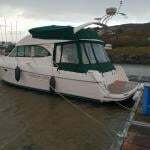 In recent years she has undergone a total restoration with Cremyll Keelboats near Plymouth in Devon, and Dominic Bridgeman of the Cremyll group will be racing her with trainee crews in her old home waters of Dublin Bay. The Flying Thirty Huff of Arklow racing off Dublin Bay while under Douglas Heard's ownership in the 1950s. Built by Tyrrell's of Arklow in 1951, the hugely innovative Huff has recently had a major restoration, and will be making her return to Dublin Bay to take part in VDLR2015. Among the newer boats on the bay, the 2013 champion Checkmate XV is still very much in the picture, but now she's owned by Howth's Dave Cullen, and took second overall in class in the Kinsale series a week ago. In Dun Laoghaire next week, she's with other Half Tonners at the lower end of the Class 2 rating band on 0.944, almost 200 rating points below the new Biggs boat. Class 2 also includes the Division 3 winner at Kinsale, Richard Colwell & Ronan Cobbe's Corby 25 Fusion (HYC) which bested VDLR 205 Chairman's Sigma 33 White Mischief in a real duel after they went into the final day's racing equal on points, while another Kinsale success story in the Class 2 lineup is Paddy Kyne's X302 Maximus from Howth, overall winner of the Portcullis Trophy for top ECHO boat. In between the two Checkmates on ratings, we find most of the cruiser-racer fleet, with Class 1 shaping up some interesting competition between the likes of Paul O'Higgins Corby 33 Rockabill (RIYC), Kenneth Rumball skippering the Irish National Sailing School's Reflex 38 Lynx, and two very sharp First 35s, Prima Luce (Burke, Lemass & Flynn, NYC & RIYC) and another former Scottish Series champion, John Corson (Clyde Cr C) with Salamander XXI. This year's Scottish Series Champion and the Afloat.ie "Sailor of the Month" for May, Rob McConnell of Dunmore East, will certainly be racing in the VDLR 2015, but whether or not it's with his all-conquering A35 Fool's Gold (second in class at Kinsale) or aboard another boat (a Flying Fifteen) remains to be seen. And the Top Sailor Count doesn't end there, as there'll be at least four Olympic sailors involved in four different classes, with Robin Hennessy racing in what has all the marks of a quality International Dragon fleet against the likes of former Edinburgh Cup winner Martin Byrne, Annalise Murphy racing in the Moths which will surely be a change from the Water Wag which she raced with her mother Cathy MacAleavy (also another ex-Olympian) last time round, and Mark Mansfield helming John Maybury's J/109 Joker 2. After Joker 2's class overall win in Kinsale, we can expect a battle royal in the J/109s with boats of the calibre of Ruth for the National title fight. The J/109s are the queens of an impressive array of One Design keelboats which includes Sigma 33s (where VDLR 2015 Chairman Tim Goodbody's White Mischief is racing under the command of Paul McCarthy), Beneteau First 31.7s, Shipman 28s having one of their best gatherings of the year, Ruffian 23s with a good turnout, the attractive First 21s which are steadily gaining traction as a Dublin Bay class, and best OD keelboat turnout of all is by the Flying Fifteens, nearly all of them under the NYC flag. Olympians all – in VDLR2013, Olympic sailors Cathy MacAleavey (1988) and her daughter Annalise Murphy (2012) raced the family Water Wag Mollie. But while Cathy will be sailing Mollie again this year, Annalise will be on her own racing a foiling International Moth. Veteran classes include the IDRA 14s from 1946, the Glens from 1945, the Howth 17s of 1898 which pre-date the 1902 Water Wags, and the 1932 Mermaids, the latter being in the interesting position of no longer having an official division in Dun Laoghaire, yet it's a Dun Laoghaire skipper, Jonathan O'Rourke of the National, who continues to dominate the class both at home and away. With large fleet numbers afloat guaranteed, the shoreside programme is appropriately busy, with the official side of each day's racing concluded by the evening's daily prize-giving at one of the four waterfront clubs. But with so many sailors involved, there'll be action in all the clubs – and at other establishments in Dun Laoghaire - throughout the week. The scene is set, let the party begin at a venue which has been staging regattas since 1828.